This is a long time coming, but, finally, I had my first cooking class with the lovely Mrs. F!! Granted, this happened last Wednesday and as usual, I’m horrible about updating on time, but let’s just get into the nitty-gritty. Mrs. F is an American woman from Iowa who’s been living here in Florence for the past 35 years, having married an Italian man (named Fabio) and settled in the city where she’d studied abroad for a semester. Actually, she just never left once that semester was done. Funny how I’m meeting all these women who just dropped everything to live out the rest of their lives here . . . Sign, anybody? In any case, the cooking classes include five three-hour sessions encompassing the Tuscan meal, meaning four courses: antipasti, primi piatti, secondo, and dolce. After we learn about the respective history of each dish we happen to make that day, we get to eat. Of course, this all comes at a price and after factoring in the cost of the ingredients, time, and such, we all had to shell out 170€ to enjoy this little course. Not too bad, considering we’re going to be using these skills for a while, but I definitely haven’t been as frivolous with my money since dropping that cash. Mrs. F. also provided us with a cookbook of our lesson-meals that she wrote herself entitled: Cucina Italiana: From Scratch. Appropriate, since we are literally building from the most basic up. I think we’re going to start every lesson with flour, water, butter, and eggs. She wants us to be able to use everything we come into contact with in a versatile manner. Our antipasti assigned was meant to be Polenta piastra con pecorino (grilled polenta with cheese), but since Wednesday topped the charts at a whopping 92˚, we went for a cooler dish instead, a broken-down version of bruschetta whose name for the life of me I cannot remember. Basically, it consisted of hardened bread nubs watered down into crummy bits, cuts of fresh onion and tomato, and copious amounts of olive oil. Yes, Mom, I ate everything, even the raw onion. 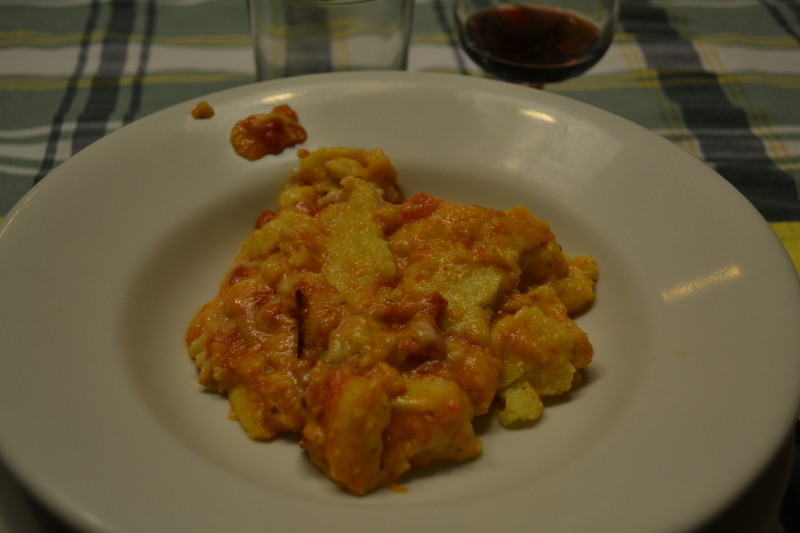 Accordingly, the primi piatti was supposed to be Pappa al Pomodoro (tomato-bread soup), but it was way too hot so that was shunted down the line of alternative recipes to Polenta Pasticciata, which is essentially a lasagna with cold polenta slices instead of noodles. It came out of the oven bubbling like a pit of hell, but it tasted divine (haha, oh, sooo corny . . . points for puns). I’m pretty sure that the two boys in my class and I finished off half of the dish to ourselves. Mrs. F keeps talking about how she often has to cook more for the boys in her class, but I’m pretty bent on convincing her that she has to cook more for me too. 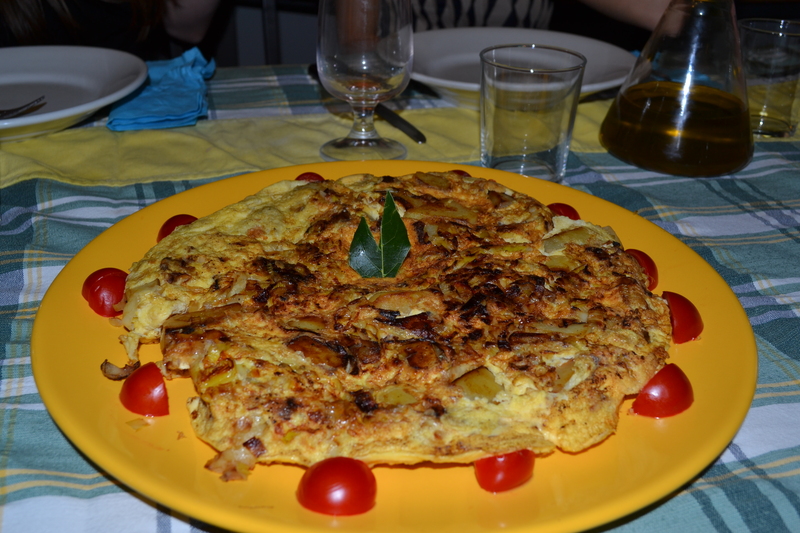 Secondo was the frittata di porri e patate (leek-and-potato frittata), and those of my family should know this because of that one time we did Iron Chef for Easter some four or five years ago (maybe more?). I think Dad and Marc were the pair with potato as the secret ingredient and they threw together a frittata. This one more resembled the Spanish tortilla, though there was definitely more egg than I’m used to. 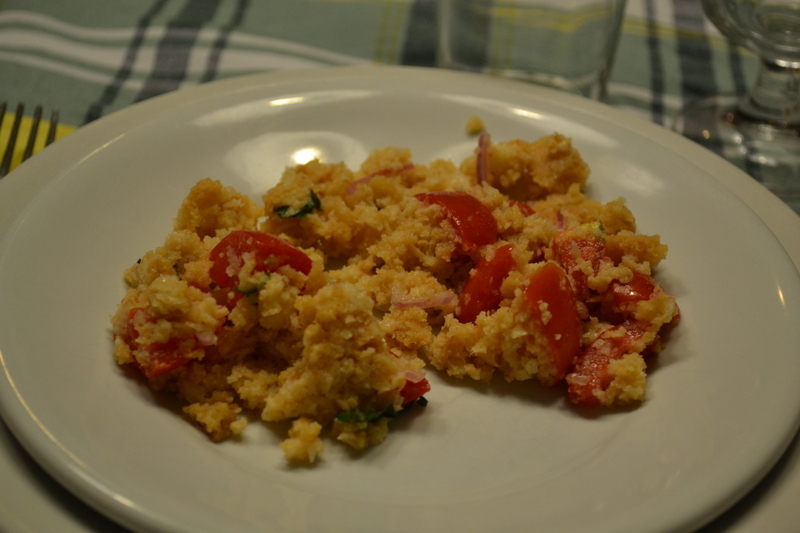 Granted, it tasted delicious and it was quick and easy to make. The only qualms I’d have about doing this at home would be the flipping part. Not sure how well that’d go. 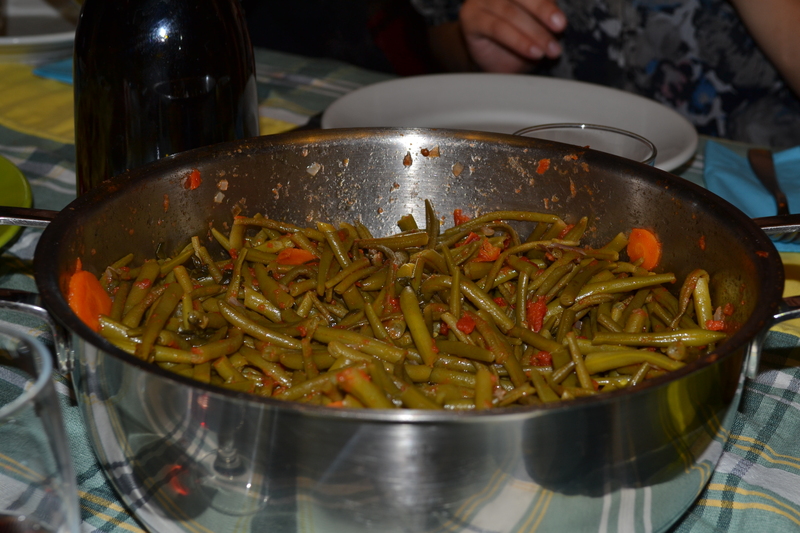 This was served with a side of fagiolini in umido (stew green beans) which were a bit soggy, but I like my green beans with lots of crunch. I pigged out. 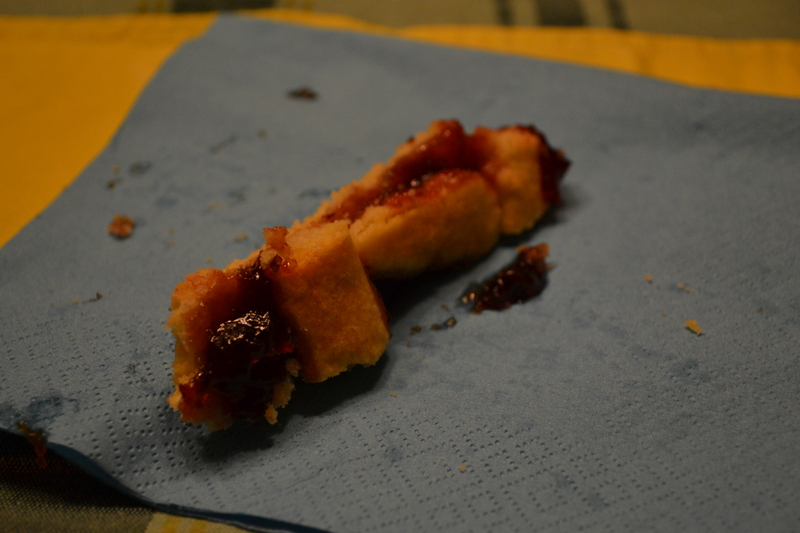 Finally for dessert was the crostata di more (blackberry torte). If you’ve ever seen Paula Dean on the Food Network, you know that she loves butter. Apparently, so does Mrs. F. We put half a stick of butter into the dough, and boy could you taste it in the AIR when that torte came out of the oven. She told us that the torte could be made with a variety of jams in it, and as proof, we used a plum jam she’d made herself from the seasonal plums on sale at the market this month. The dough could also be used for cookies. Imma have to get me some flour next time I go to the supermarket. And some jam. This thing was delicious. I felt fat rolling myself home after that class was finished. All in all, I’m excited to be cooking again this coming Wednesday. I’ve taken a look at the menu, and we’ll be having focaccia, pasta soup, lemon chicken and eggplant parmesan, and some sort of sweet fake salame? Not sure about that one. Of course, I’ll try everything, even though eggplant has a funny texture. Slimy. Yay. I can hear thunder out my window now, and the clouds are booking it across the sky. I wonder if that means rain for tomorrow? Joy. Anyway, hope you’ve enjoyed the photos! If you’re interested in the recipes of my weekly classes, shoot me an email at via.firenze.sa@gmail.com or write a comment down below! IMPORTANT: I have a History of Food class paper to write, and I have a couple of ideas for the topic, but I’d like to hear your thoughts on my choices. Let me know in the poll below, and I’ll announce on Wednesday what I’ve decided to do! Thanks! That choice of cooking with science could be pretty interesting. Lots of shows on the cooking network have shown scientific techniques to produce a dish. Iron Chef has challengers who come prepared with their scientific gadgets to battle Bobby Flay. Sometimes they win. Could be cool to write about it, but my vote goes to wine. That was my second choice! Nikki, I am so enjoying your posts! The cooking class sounds great; and you get to eat your work 🙂 . I would love to get the recipes. Glad you’re having such a good time. Am fascinated by the Blood Wars paid in Chocolate topic???? Is this going down the Latin American conquest route or is this death by chocolate??? Millie is also interested in finding out what these blood wars may mean in relation to the chocolate. In any case, whaterver topic you end up writing about, we looking forward to reading it! Your blogs are great – and yes please to the recipes! 1 | viafirenze”. I personallywill surely end up being back again for much more reading through and commenting soon enough.